EISRIESENWELT, AUSTRIA—Tracing his glove along a chalky layer in a house-size block of ice that lines this cave in the Austrian Alps, Michael Behm can feel all that is left of an ancient warm spell. The ice, likely formed over the decades or centuries as calcium-enriched rainwater trickled deep in to the cave and froze, must have once warmed enough on top to melt and release a few years’ worth of the mineral, the Vienna University of Technology geophysicist explains. Behm is one of a small but growing number of researchers who are investigating whether persistent ice that drapes the inside of some caves can reveal what the climate outside was once like. At a recent workshop in Austria, which included visits to several nearby ice caves, about 50 such scientists discussed this formidable challenge and reported tantalizing progress. One team, for example, has been using ice within a Romanian cave to reconstruct a 1000-yearclimate history of the local region. By dating layers of cave ice that form from ponds of trapped rainwater and then analyzing the isotopes and other substances that make up those layers, these scientists aim to chart past changes in temperature, rainfall, and other climate indicators such as carbon dioxide levels. It’s a strategy paleoclimatologists have long pursued with ice cores taken from glaciers and polar caps, or with layers of lake sediment, but cave ice has proven much more difficult to study and interpret. 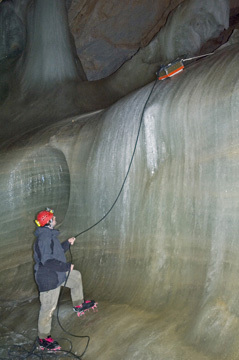 Every cave is unique in how water trickles in and freezes, and researchers have to go to great lengths to establish whether the ice layers they see represent annual, seasonal, or other time scales of deposition. 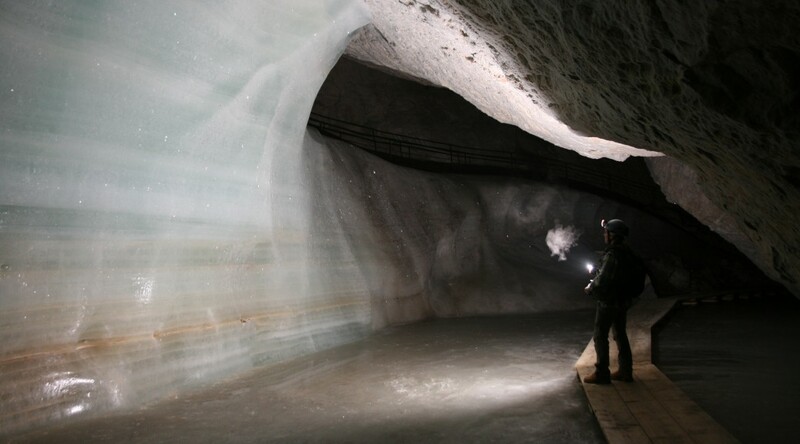 “Cave ice is a complicated business,” says Greenland ice core specialist Sigfús Johnsen of the University of Copenhagen. But it’s one worth pursuing, say Behm and others at the Austrian workshop, as polar ice cores don’t offer insight into the climate histories of temperate regions, where most people live. “There’s an urgent need to look for ice archives outside the polar region,” says environmental scientist Dietmar Wagenbach of the University of Heidelberg in Germany, who attended the workshop. Mountain glaciers aren’t the easy answer either, because they are less representative of the climate near settled areas. Glaciers require massive snowfall and long-lasting cold to form, but ice can form in caves and trap climate information even in regions that don’t normally frost over. A cave with small temperature differences at its entrances can develop strong internal winds, as air moves to equalize the cave’s internal temperature. If the wind gets fast enough, as in a constriction, it can also get cold enough to freeze standing or dripping water. Long before electric refrigerators, ancient Persians used the same principle to make ice. The study of tree rings, lake sediments, and other so-called climate proxies has provided some history of the climate in temperate regions, but paleoclimatologists are still eager for other sources of data to help them predict how future changes in climate might alter these locations. And ice is a paleoclimatologist’s best friend because it can retain many different clues to the past climate. In polar regions, recently fallen snow slowly becomes compressed into a layer of ice whose ratios of hydrogen and oxygen isotopes reflect the atmospheric temperature at the time of condensation. Such ice can also trap grains of pollen and dust and air bubbles that reveal concentrations of gases such as carbon dioxide that are important to reconstructing past climates. Climate studies of ice cores from glaciers and polar caps took off in the 1960s, and some of those cores may record climate histories going back a million years. Similar studies of cave ice, however, have lagged far behind. Speleology, the scientific study of caves, dates back to the 19th century, but most such work has concentrated on the geology of the caverns, or the unusual flora and fauna found within them. Emil Racoviță of Cluj University in Romania, a pioneering cave biologist, may have been among the first to recognize the record-keeping potential of cave ice. In a 1927 report on his exploration of the Scărișoara cave in Romania, he notes that such ice must have formed under different climatic conditions and that it would be good to “decipher the passionate enigmas of the history of the ice.” Decades later, Racoviță’s assistant Mihai Serban followed up on this idea, reporting in an Italian journal that he could measure certain isotopes in cave ice from Scărișoara, although the data didn’t provide climate clues. The idea of doing paleoclimatology on cave ice attracted serious international attention about 11 years ago, when a pair of Canadian cavers—one a cave operator in Alberta and the other a geography master’s student at the University of Calgary—published a study that identified different mechanisms of cave-ice formation. They reported in the journal Boreas that by looking in the right places in caves and taking into account how the ice formed, they could extract paleoclimatic information from isotopes in the cave ice. The idea gained more momentum from the first workshop on ice caves, held in 2004. But even now, few scientific papers have been published on the topic, as a variety of technical difficulties have stymied researchers. Small rocks in the ice have halted efforts to extract long ice cores. And Wagenbach’s student Barbara May notes that cave ice is actually too warm for drills designed for extracting ice cores from glaciers; melted and refrozen ice jammed her drill until she added a lubricant, which she fears could interfere with many analyses, including those of air bubbles, isotopes, and particles in the ice. Teasing climate clues from cave ice isn’t as simple as extracting a clean core, however. The most commonly drilled cave ice mimics the tidy horizontal layers seen in sedimentary rock. A single layer, however, could represent either a year’s worth of rain that trickled into the cave or just a few months when a river poured in a torrent of water. Each process would preserve different clues to climate, so researchers need to determine how water has historically entered a cave. The size of the ice crystals, whether the ice froze from the bottom up or from the top down, whether it partly melted or eroded after solidifying—these and other nuances can affect measurements and require careful interpretation, Behm says. That complexity is one reason cave-ice studies have progressed so slowly. Another is that the topic is just a sideline for most researchers. Behm, for example, uses ground-penetrating radar (GPR) to study Earth’s crust. He only recently began trying the technology on ice caves. 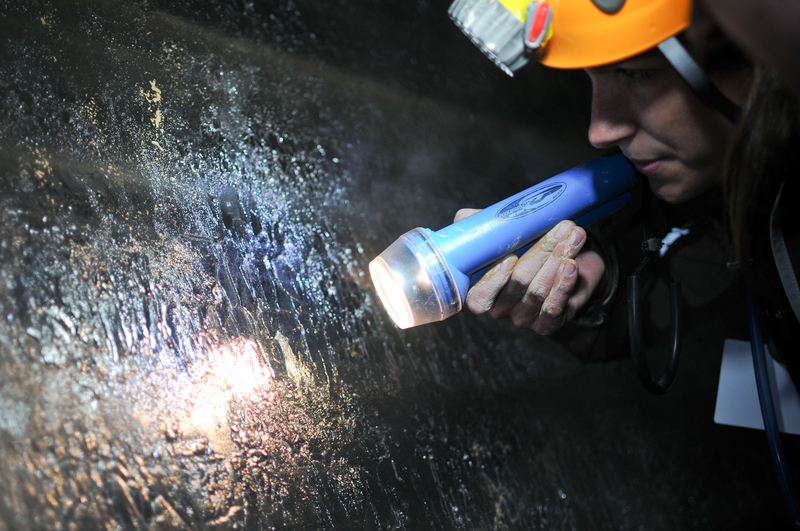 “Cave ice is such a perfect insulator that the signal-to-noise ratio is very high for GPR,” he says. In studies of four Austrian caves, Behm has found layers in the ice that reflect his radar signal. He suspects that they may be accumulations of calcite from periods when ice melted and released its dissolved minerals, a possible sign of outside climate changes. In June 2007, May drilled a 7-meter ice core from one of the caves, but so far her isotope studies haven’t nailed down firm dates along its length. Others have had better luck. At the 2006 ice caves workshop, a Danish-Slovakian team reported extracting a 14-meter core that they dated at about 1250 years based on carbon dating of a bat found in nearby ice. Sharp changes in the accumulation of ice from year to year make the core hard to interpret, but it does show signatures of some climate oscillations found in other records. Some researchers at the Austrian workshop compared the debate over the usefulness of cave ice to a similar one that took place decades ago over stalagmites, towers of limestone that build up in active caves. At first, paleoclimatologists derided the idea that stalagmites could hold valuable data, but now studies of “speleothems” have become standard practice (Science, 27 July 2007, p. 448). This feature first appeared in Science Magazine: [html] or [pdf].